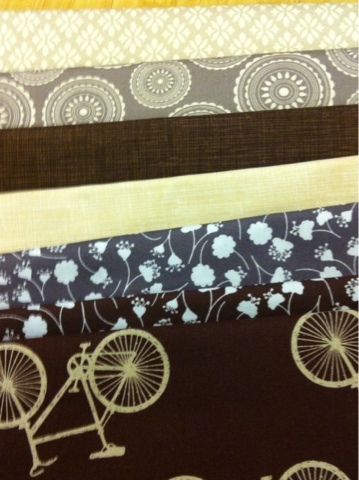 Dipity do dah: New fabric! This fabric, from Pink Castle Fabrics, is for a quilt for D&H. I found a free quilt design website (think it is called quiltmania but not 100%) which also works out how much fabric you need. D is a mad cyclist and H is very good for and to him! So the echino, cycling in brown, is the fussy cut centre of the churn dash blocks I'm planning to do. For once I've also remembered to buy the backing fabric. (Promise I will put pictures in when the pc is fixed).